It had only been a month since I was last in Seattle yet I didn’t mind coming back. Aside from the weather – which was definitely not cooperating on this day – it’s a great city to explore wine, food and spirits in. 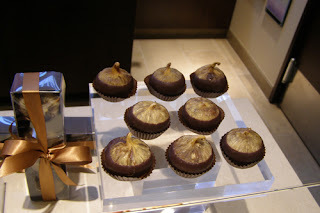 We were going to start with a mixture of all on the Chocolate Indulgence Tour, one of the offerings from Savor Seattle. We met with Brett Affleck-Aring (yes, he is related to the Oscar-winning actor) at the Mayflower to start our tour at that hotel’s Oliver Bar. 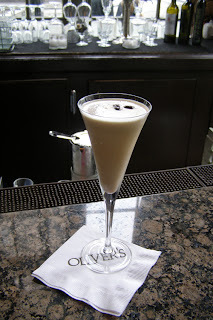 Brett shared our motto that chocolate is the fifth food group and he was prepared to show us all aspects of the treat, starting with the Seattle Flatliner ,a coffee and chocolate cocktail served by bartender Patrick. This yummy mixture of Café Umbria, Dark Crème de Cacao, Bailey’s Irish Cream and Demerara 151 Rum is shaken with ice (there’s no blender here). It’s the perfect drink to make you forget about the wet day, something Seattle gets about 200 days a year. While we were sitting at the bar, I also spotted an absinthe fountain and Patrick let me try some of Pacific Distillery’s Absinthe, a licorice spirit that’s not as thick as Sambuca. We ventured out in the rain to Dahlia, a bakery that belongs within the chain owned by Tom Douglas. 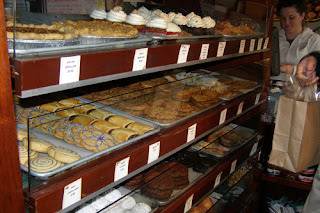 Everything here looked more than good enough to eat, but Brett had already set us up with rich and chewy Chocolate Crumble Cookies and mini Coconut Cream Pies with White Chocolate. 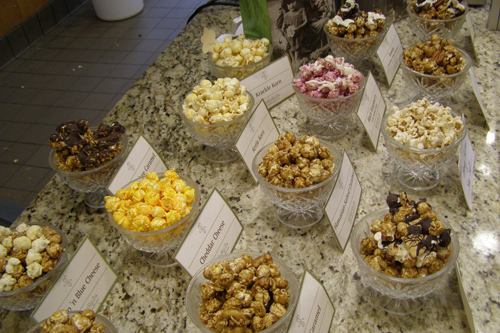 I was feeling full already and glad we had to walk a bit to our next stop, Chocolate Box. This unique shop is a must visit for any chocolate lover coming to Seattle as they have items from more than 50 local, independent chocolatiers. 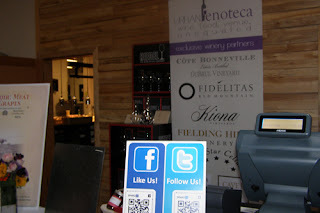 You can also have wine here (with or without chocolate) at the Wine Bar next door. We skipped the wine (for now) and instead tasted some perfect Brownies from Chef Matt Carter and creamy Chocolate Dreams from Wink Cupcakes, washing it down with some Sorbet and Gelato from Gelatiamo! It was then time to head back in the rain and down toward the water. I had actually stopped at The Confectional on my last trip, but one never has to beg me to revisit cheesecake and I enjoyed a tiny taste with a short gulp of thick and spicy drinking chocolate. I also learned that The Confectional was building a larger location down at Capitol Hill. We said goodbye to Brett from Savor Seattle and had a little while to get up an appetite for an absolutely delicious lunch at Art, the restaurant at Seattle’s Four Seasons Hotel. I really loved this menu as Chef Kerry Sear brought the slightly unusual to the dishes without going over the top. 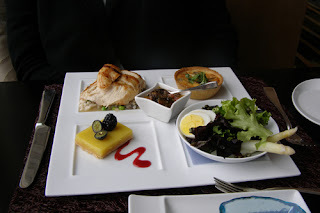 Lynn had the Market Tray, a kind of gourmet TV dinner that brought together a meal on a plate – Mixed Baby Lettuce with White Asparagus, Capers and Egg in Morel Vinaigrette; Morel Mushroom and Caramelized Onion Tart; Grilled Chicken; and a Lemon Tart with Berries. She thoroughly enjoyed it. I had some of the Minestrone Soup, which was a bit too spicy for my taste, but full of fresh vegetables, and a wonderful Crisp Baked Beecher’s Cheese Sandwich, which was perfectly crispy. I washed it down with a light Matanzas Creek Winery Sauvignon Blanc. Before we left we were treated to the restaurant’s homemade donuts, which I compared to the Italian Zeppoles you get on the streets of New York, with even more flavor and no grease. After lunch, we walked around the Pike Place Market for awhile. Lynn had never seen it and I didn’t mind going through again and enjoying the hustle and bustle of food and arts vendors for awhile before we were picked up by Terry Thompson for our trip to Urban Enoteca. This is a unique wine concept within the city limits where you can taste a variety of wines in a comfortable atmosphere. I fell in love with the place and wished I had one in my own neighborhood. While I toured the huge space that Urban Enoteca has and listened to Thompson’s even more exciting plans for the future (which includes bringing in more of wineries), I also tasted some Washington wines I had missed previously, looking for the standout ones. I found it in the 2008 McCrea Winery Picoul, a Rhone varietal that is full of pear and citrus; 2006 Cote Bonneville Carriage House, a complex red blend heavy on the cabernet sauvignon; 2007 Kiona Chenin Blanc, tropically, peachy and just plain yummy; and the 2006 Cave B Cabernet, smooth with lots of fruit. 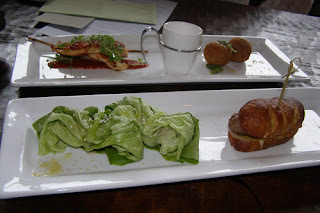 We also sampled some of Urban Enoteca’s small bite menu and you shouldn’t miss the Pork Belly Lettuce Wrap and the Risotto Croquet with Cherries. 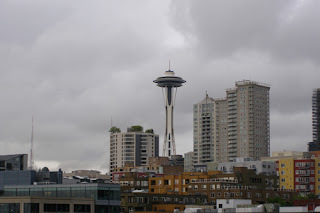 When we returned to the Celebrity Cruise I was realized we were in a great spot to see the Space Needle from our balcony. The weather wasn’t cooperating for any sunset photos, but I enjoyed the view as we sailed away. Food was not exactly on my mind as ithad been a day full of eating (and drinking). I had a very light dinner of soup and a Caprese Salad and got plenty of rest for my full day in Victoria, British Columbia.